© 2002 Pate-Meadows Designs, Inc. 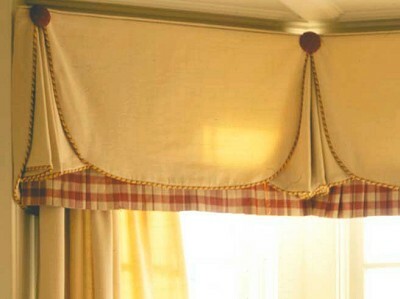 This tailored valance with pleated underskirt can be adapted to fit any size window. The finished length of the valance is approximately 22” in length. This valance works best when constructed out of a medium-weight decorative fabric with medium to lightweight contrasting fabric for the pleated underskirt. The gusset section and side jabots are self-lined in the same fabric as the face fabric. The swag sections are lined in regular drapery lining; however, a decorative trim or piping should be added to prevent the lining from showing at the bottom of the treatment. The pleated underskirt is attached to regular drapery lining. This valance is mounted on a dust board; either a 1 x 4 or 1 x 6 can be used depending on the projection desired. -The ruffled bottom underskirt can be altered to be a flat design for a simpler, more tailored look. These amounts are for a valance measuring 42” wide finished. See chart below for other window widths. These amounts are based on 54” wide fabric. Add extra fabric for matching of patterns. 1 ½ yards of decorative contrasting fabric for pleated underskirt.